UBICHEM Pharma Group has entered into a strategic partnership with Swiss-based XiMo AG, a company focusing on the development and application of proprietary metathesis catalysts, for use in the specialty chemical, agro chemical, renewables, pharmaceutical, flavors and fragrances, polymers and advanced materials sectors. “Our molybdenum and tungsten catalysts are based on the breakthrough scientific research of founders Amir H. Hoveyda, Patricia and Joseph T. Vanderslice Millennium Professor of Chemistry at Boston College, and Richard R. Schrock, Frederick G. Keyes Professor of Chemistry at the Massachusetts Institute of Technology, co-winner of the 2005 Nobel Prize in Chemistry” – said XiMo’s founder and COO, Prof. Dr. Georg Frater. UBICHEM Pharma Group’s role is the development of a large-scale process based on the laboratory procedure provided by XiMo. In this stage of the cooperation, UBICHEM Pharma Group has successfully started the catalyst-production in kg-quantities. Prior to this, UBICHEM Pharma Group upgraded its kilo-lab and set-up a dedicated process development laboratory to be able to meet the special conditions used during the synthesis of the catalyst. 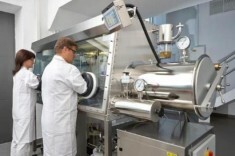 These facility changes were co-financed by the first two companies who would benefit from using XiMo’s catalyst in their synthetic procedures, Elevance, a high growth specialty chemical company providing high performance renewable solutions to a wide range of industry applications, and another, large multinational, that requested confidentiality. “We set a target for the near future which is a dedicated production facility providing up to 10 Mt Mo/W metathesis catalyst per year” – clarified Jozsef Repasi, UBICHEM Pharma Group’s CEO.